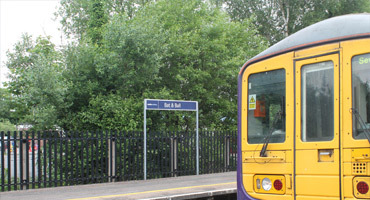 Steel Palisade is still regarded as one of the most secure fence systems on the market today and is predominantly used by Network Rail and other utility providers. The three aris rail system along with a thicker pale provides added strength and helps to prevent the forcing of pales apart. The triple points provide an excellent anti-climb deterrent. Available in galvanised finish or galvanised and a range of polyester powder coated colours. Finish: Galvanised to BS EN ISO 1461 after manufacture and option to polyester powder coat a range of colours. 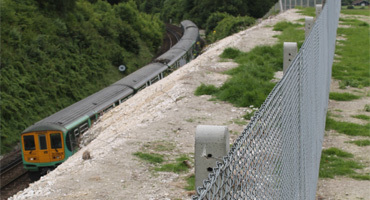 Chainlink fencing has been and still is today, the most commonly found boundary fence system used throughout the railway infrastructure. Where there is a need for greater perimiter security then steel palisade is still regarded as one of the most secure fence systems on the market today. 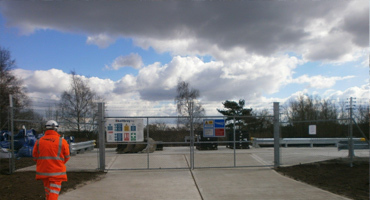 We manufacture in-house and install all types of pedestrian and vehicle access gates to comply with Railway requirements. 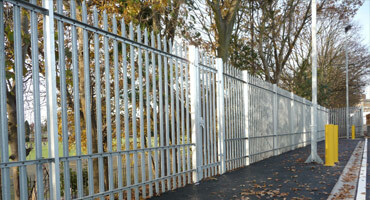 Palisade fencing fixed to an existing platform concrete structure. 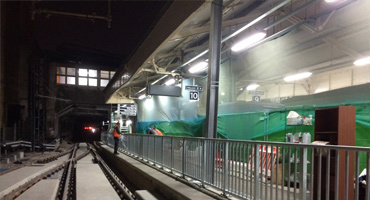 Bespoke pedestrian guardrail, designed, engineered and installed by ourselves for the Wimbledon Line Enhancement works.